It’s been 17 years since the original Blair Witch Project hit theaters and became a pop culture phenomenon back in 1999. The film was a smash hit that brought in just shy of $250 million off of a meager $60,000 budget. The popularity reached a fever pitch thanks to clever marketing which included the sci-fi channel documentary Curse of The Blair Witch that played up the “factual nature” of the film. Despite being a huge hit and receiving a sequel the very next year, the Blair Witch franchise has largely fallen out of the pop culture zeitgeist since the turn of the millennium. The Blair Witch Project didn’t just birth a new sub-genre, but it also created a culture of found footage horror fans who are still hungry for more today. Has the time finally come to bring yet another popular franchise back from the dead to kick off the 2016 horror movie season or is the Blair Witch Project better left a legend? The film is set 20 years after the original film and follows James Donahue who is the younger brother of Heather from the original film. Since Heather’s disappearance, James has been obsessed with trying to learn more about the entire case. After years of research, he finally gets a lead that takes him to the mysterious woods from the first film with a group of his closest friends and a couple of mysterious locals. The team prepares by buying the best cameras money can buy, a GPS tracking system, and a drone. With no real certainty about what they’re going to find, the team lead by James heads into the woods. Recreating the same scenario as the original with upgraded technology is a promising and potentially fun angle to bring to a classic found footage film. It harkens back to the age old theme of magic versus technology and also reassures viewers that this film isn’t pulling any punches when it comes to making these characters as smart and savvy as the audience. These are people wondering into the woods on a mission and they are prepared for things to go wrong. The problem is the movie quickly abandons any real meaningful use of this set up. In fact, this film squanders a number of its very richest ideas. What if they use the drone to scout the….? Whoops. They’re lost, but at least they’ve got the GPS? Nope. Cell phones? The use of technology in the film only represents the illusion of change. In reality, these kids might as well have gone into the woods to party like it was 1999. Some of Blair Witch’s most interesting contributions to the mythology including the manipulation of space,time, and the power of the cabin are all squandered and left on the fringes of the film’s straightforward narrative beats. Once you strip away the interesting nuggets, the only thing of substance you’re left with is a movie we’ve already seen. If you thought we’d finally left the era of the “lega-sequel” behind after the huge successes of Star Wars and Creed, you thought wrong.Adam Wingard‘s Blair Witch is a tough beast to pin down. It’s no doubt a sequel in that it takes place after the original Blair Witch Project, but instead of offering something fresh, it largely follows the same plot and story beats of the first film. No matter the official label, this film is yet another clever repackaging of a film we’ve already seen. The plot of these movies may be structurally identical, but there are a couple of things that really set this film apart from the original Blair Witch Project. The first is the film’s baseline goal and approach to scaring its audience. The original film was a slow burn horror that thrived on an oppressive atmosphere and uneasy tension between its characters. Adam Wingard’s Blair Witchon the other hand is more in line with what the found footage genre has become in the years since. It’s all about assaulting the senses and attacking you when you are most comfortable. Another noticeable difference with this film is the editing style which is just a bit too smooth for my taste. Found footage films are premised on the idea that someone out there discovered this raw video sometime later.The original Blair Witch Project was so convincing that it scared masses into believing that it just might be real, but unfortunately the same can’t be said about the neat polish of Adam Wingard’s Blair Witch. This may not be immediately noticeable, but avid horror fans are going to be wary of the nicely sequenced editing that fits together just a little bit too well to be believed. It may be retreading old water, but what about Adam Wingard’s acclaimed signature direction? His past films Your Next and The Guest are both known for toying with plot structure and subverting the horror genre tropes we’ve all been watching for decades. 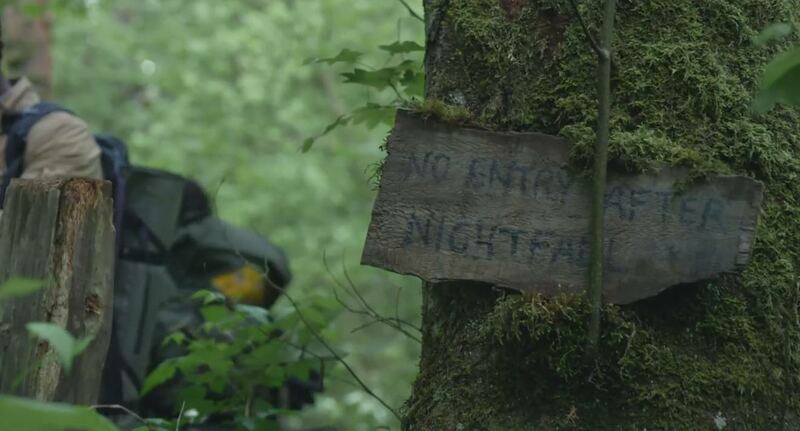 Adam Wingard’s Blair Witch does not offer much new in the realm of plot, but Wingard and his longtime writing partner Simon Barrett still find plenty of ways to play with your expectations. With this film, his misleads are more in the technique and use of the camera. Instead of twisting plot beats, he finds new ways to surprise and trick you by avoiding jump scares in favor of the fear of anticipation. The script and conception of the story are hardly novel, but Adam Wingard continues to sharpen his skill set as one of the smartest and most talented up and coming directors working in horror. Adam Wingard’s Blair Witch is a serviceable if forgettable found footage movie that might be just the thing to get you in the mood for the October horror movie season. Its third act is filled with enough intense thrills and smart techniques to make the rest of the journey worthwhile. You’ll likely find yourself frustrated by a number of squandered ideas and the recycled storyline, but if you’re going to the movies to hop on a roller coaster for an assault on your sense, this is just the horror movie for you.